You could hire a fancy consulting firm, make the list longer, add some bullet points, put it into a PowerPoint presentation, and go through the whole dog and pony show. But at the end of the day there will be only one conclusion… None of the above! You see, the most important competitive edge for today's business professionals cannot be found on this list, your resume, or in any of your company's marketing brochures. People Buy You is the new standard in the art of influence and persuasion. Few books have tackled the subject of interpersonal relationships in the business world in such a practical and down-to-earth manner, breaking what many perceive as a complex and frustrating process into easy, actionable steps that anyone can follow. What is most important to your success as a sales or business professional? Many people will tell you that it's all about crafting the right pitch, making more cold calls, or having a powerful closing technique. Some will say that it's education, experience, product knowledge, job title, territory, or business dress. Others argue that it's your company's reputation, brand awareness, product, price, or service guarantees. There are even those who say it is an investment in the latest CRM software, Sales 2.0 tools, or your social media strategy. Jeb Blount says—none of the above! The truth is, success is powered by your ability to solve the problems of your customer. When you solve problems, your job is done, and the sale is made. But how do you get to that point? With strategies, stories, and fascinating examples of sales successes (and failures), Blount shows you how to evaluate your relationship tactics, customize a strategy that works for your business, and create the sales success of your dreams. "People Buy You is not just a self-evident truth, it's your opportunity to discover why and how. Jeb Blount has written an easy-to-understand and easy-to-apply set of principles and actions that can help you earn more the minute you read them." 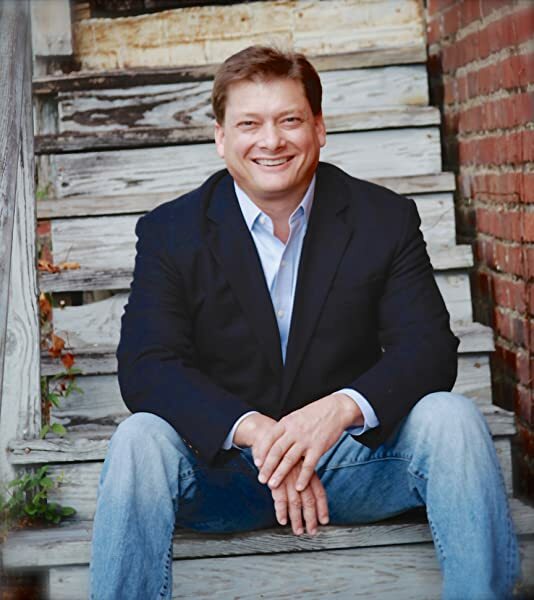 "Jeb Blount has written a practical, powerful book that will help any sales professional make more sales than ever before." "Jeb Blount nails it in People Buy You. When you turn yourself into the competitive differentiator, you're unstoppable." "Becoming a business leader or a sales champion transcends your ability to memorize a sales script or follow a regimented system. The real secret to unprecedented success starts with adopting this predominant universal law: who you are is always more important than what you do. In People Buy You, Jeb has effectively encapsulated this critical level of thinking. He delivers practical strategies to drive more sales and get more of what matters most in your life and career by leveraging your ultimate, authentic competitive edge—YOU!" "People Buy You is groundbreaking because it runs counter to all the other 'sales' books currently being written that ignore common sense. That people matter most." –Bob Beaudine, author of The Power of Who! "People Buy You should be required reading for any professional who wants to sell more, sell faster, and build a powerful brand that people talk about and refer others to. Jeb breaks all sales myths, while exploring the right way to grow relationships, influence, and persuasion in the new economy." Start reading People Buy You on your Kindle in under a minute. Books on how to increase sales probably top in quantity of any business genre. For without revenue businesses or organizations cannot make payroll, pay their vendors, ensure fixed costs are covered while still having enough monetary reserves or profits. Having been in sales for 30 plus years, I have always believed that who you are as an individual comes first before who you as a salesperson. In this book, People Buy You, Jeb really takes that belief and makes it very real as well as practical. His common sense writing approach intermixed with personal stories reinforces that successful selling begins and ends with the authenticity of the individual. Using a variety of historical to contemporary resources, he weaves a very simple and yet compelling argument about what sales is not about selling, but far more about buying. The first product or service your potential customer buys is you. The first seven chapters all lead up to the final chapter and that is devoted to your own brand. So if you want to be The Red Jacket in a sea of gray suits, to stand out in the crowd, then this is a must book to be included in your professional development plan. I have been in sales since 1987 and spent hours learning sales techniques that are far more about manipulation than building trust. I came across Jeb in 2007 when I started listening to Podcasts and I found his Sales Gravy podcast. I was so surprised to hear a professional sales trainer teaching principles based on building trust and helping the client learn what would be of the greatest value to them. In 2011 I had the chance to introduce Jeb to a client of mine. I sat in on a few of the phone conversations and found out that Jeb not only teaches and trains on relationship sales, he uses it every day to negotiate his consulting and training engagements. In my opinion this is the best book on sales I have ever read. I have purchase about a half dozen copies to give to others who would benefit from reading People Buy You. When I recently was invited to become a featured contributor for [...], I thought it a great idea to read some of Jeb Blount's work before I agreed. After reading "People Buy You," I said, "Yes, please pick me!" My first experience having someone buy me was as a cute 9-year-old holding a Sales Leadership Christmas card catalog. I was definitely likeable and created as positive an experience as I could. I learned and earned. But somehow through the years of becoming a mature, sophisticated adult, I lost touch with what was important--the relationships. Those people who bought my cards bought me because they liked me and knew me. Later in life as I sold radio advertising and other products/services, potential clients didn't know, much less like, me...and weren't interested in changing that. I agreed with them--I only wanted their money. Frankly, many of the sales professionals I coach today have that same mental model. It was for all of them, and me sometimes, too, that Jeb Blount wrote this book which when read and implemented seriously will propel your sales career skyward, to the stars and beyond. Jeb references the wonderful work of other authors like our mutual friend, Tim Sanders (The Likeability Factor). He does the heavy lifting of sorting through volume after volume of related reading, cherry picks the best, and serves it up with gravy...sales gravy, of course. This fact alone makes "People Buy You" worth far more than the purchase price. I enjoyed Jeb's work so much I read it through twice, just to make sure I got it all. Like scraping your dessert plate with a fork. 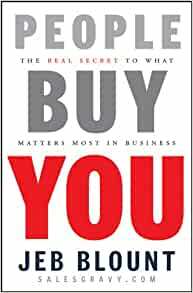 "People Buy You" is a learn-and-earn read, but really should come with this disclaimer: Read this book only if you want to grow your emotional intelligence, gain more satisfaction in your work life, and increase your income. And who doesn't want all three of those in this economy? I have read a lot of books on sales, customer service, understanding people, etc. What I like about Jeb Blount's book is that I can relate to his style and his values. You can read a lot of books about a lot of interesting things, and you don't apply any of it, because it doesn't line up with who YOU are and who YOU want to become. Jeb is street smart and empathetic, and this is evident in People Buy YOU. In his book, he reminds the veteran, and educates the rookie, about all the bad things that happen due to outside forces that work against them.His main point is that people do buy YOU.YOU are the real difference. No social media, not CRM's, not product literature, websites, or even the product, has a bigger impact on the sale than YOU. Jeb's systematic outlines for people interaction, problem solving, attitude adjustment and intentions, are powerful daily reference, that keep my thinking straight and at peak performance. Jeb nailed it right on the head. I have read probably a dozen plus sales books since my career for the last 2 years has been sales (plus I am super competitive). Out of all the techniques most books teach, he hits on the ones they never do. Reading this book will give you the fundamentals to increasing how and why people like you, how to connect with people, how to build trust, and how to solve problems. He also stresses that even though you do everything right in sales, if you have no activity it will never matter (MAKE THOSE CALLS!). And that the opposite is true, if you do everything wrong except make a lot of calls, you will still have some success. I HIGHLY recommend this book for anyone looking to improve their sales game!